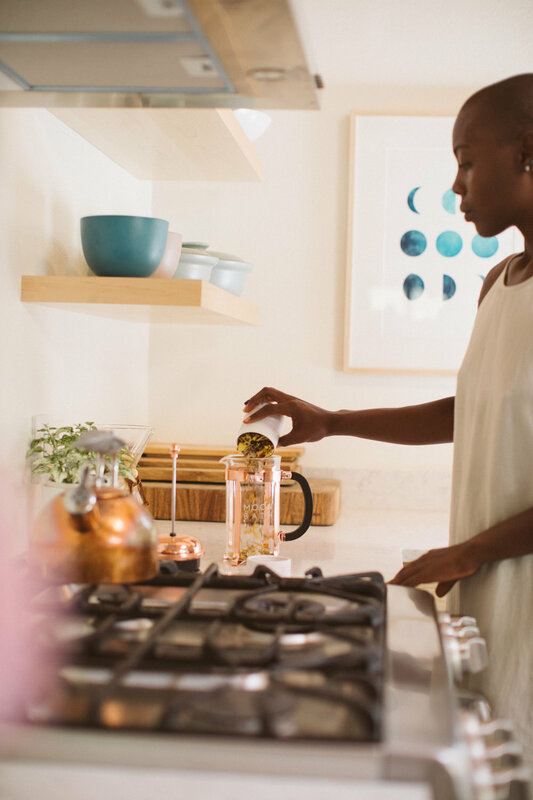 Shelby Holly-Page is a yoga instructor and Transcendental Meditation practitioner who is excited about bringing these two powerful practices back to her communities of color. When she began her journey as a yoga teacher, she noticed there weren’t many yogis or teachers who looked like her, so she has made it her mission to become inspiration for others to follow in her footsteps. Moon Bath: What is it that makes you feel most alive in life right now? Shelby: When I am doing something I love I feel alive. I love a mix of things including cooking, traveling/sight-seeing, practicing yoga, and trying a new vegan dish or restaurant. Moon Bath: You are very engaged in making the world a better place, and we appreciate that! Talk to us about one of the issues you are most passionate about, and what we can all do to support. Shelby: I am really passionate about bringing appreciation and recognition back to women of color. Putting yourself in someone else’s shoes always allows you to see things in a different light, so if you are a white woman, something as simple as listening to a woman of color speak about her experiences and trying your best to understand is a wonderful way to support. You might also check out groups in your local area where women and or people of color can go to express themselves. Stand up for a woman of color when you see her in an uncomfortable position. Take the time to bring broader awareness back to the struggle of women of color, perhaps by posting supportive messages on your social media, writing an article or doing a public speech. Staying silent while you see other women struggling (for whatever reason it may be) is not only not supportive, it is part of the problem. It takes everyone to make change, not just a few people. Moon Bath: What would your private yoga clients say is most special or unique about what you bring as their instructor? Shelby: I allow my students to be a bit more open with their personal practices. This means I always allow my students to take what they need from a session. I am happy to teach them what it is they feel their body needs, as compared to what I think they should be doing. If they want to work on handstands or backbends the for the entire session, I honor that. I’ve had people start off not being able to do something like the splits, a forearm stand, or touching their toes, and eventually by the end of a month or two months they’ve improved by 75% or more. In the process, they’ve gained more flexibility, strength and confidence. Their bodies and minds, as well as their expectations of themselves, have shifted. Moon Bath: How has Transcendental Meditation made a difference in your life? Shelby: I have found that when I really focus in on my Transcendental Meditation practice, I am able to manifest all sorts of things, including a car, my living situation and a modeling contract! The modeling contract was my favorite by far. I told myself I wanted to get scouted for modeling, and so I sat down each day for 20 minutes and envisioned myself being “discovered” by a scouting agent. About a month into it, I was walking through the farmers market and someone approached me to ask if I was already signed with an agency. She slipped her card into my basket of kale and told me to contact her if I wanted to look into it. Funny enough, it was for one of the agencies I had mind while I was meditating, and they did in fact sign me. That’s one of my favorite manifestation stories that I like to share when people don’t believe in the power of creating your own reality. Anything you want, you are able to obtain through focus, positive thinking and dedication. 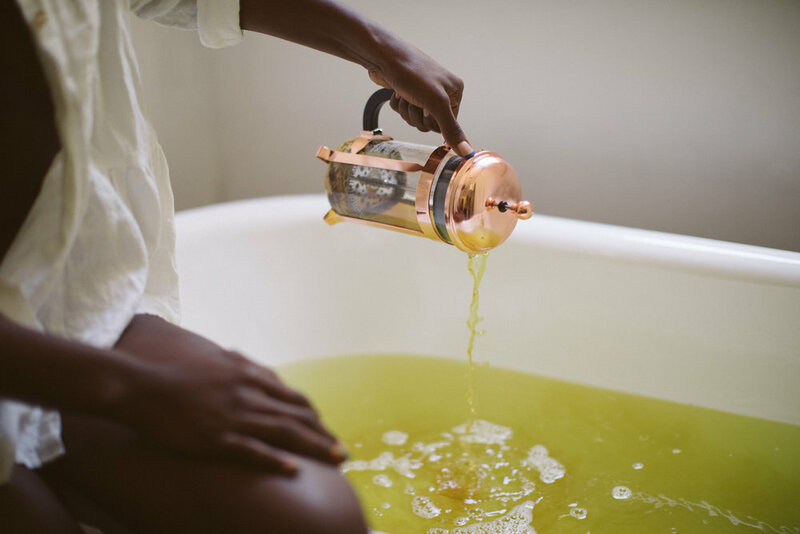 Moon Bath: What are your top three most important self-care rituals? 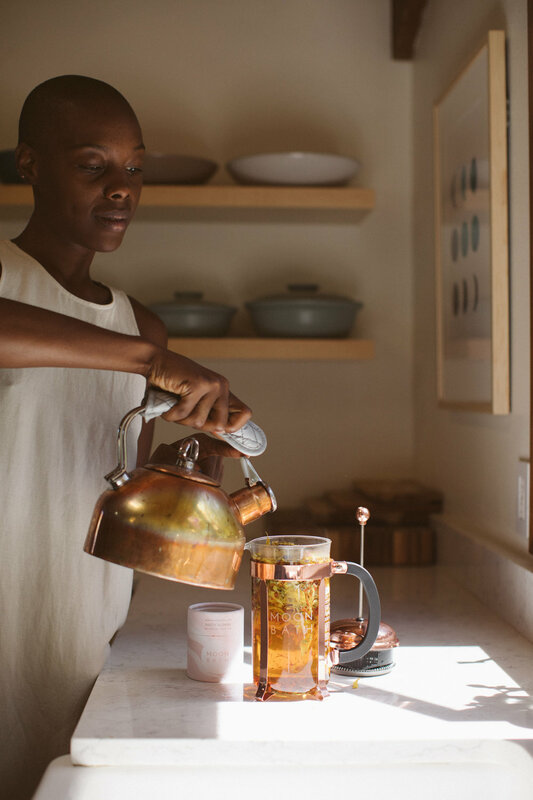 Shelby: My top three self care rituals are drinking detox water, oiling pulling with coconut oil and lathering myself once or twice a day with my homemade body butter. 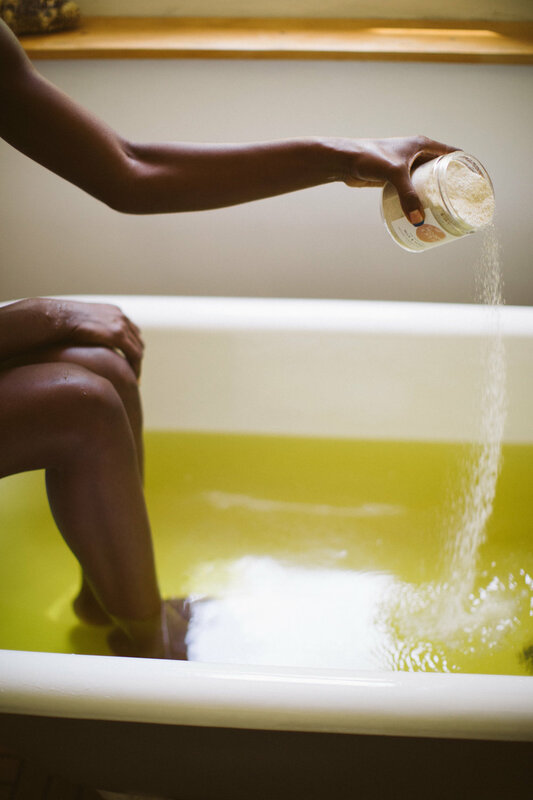 Moon Bath: Give us a glimpse into your mind by sharing a thought that has crossed your mind during one of your baths (you can be real with us!). Moon Bath: You’ve just taken a long, luxurious Moon Bath. What’s next? Shelby: A delicious vegan meal or snack! Moon Bath: Where might we find you on a Saturday morning? Shelby: You'd most likely find me eating out by myself somewhere, at a farmers market or playing frisbee outside.